Great way to start our adventure in Stockholm. TOUR GUIDE RESPONSE: Thank you, it was a pleasure to meet you and Sarah. Keep on travelling and add countries to your special collection! TOUR GUIDE RESPONSE: Thank you! I hope your vacation continues to be a great one. It was very interesting to get to know you and your wounderful wife. Sofia was very flexible to make the tour fit our group of older individuals. She was very knowledgeable about the places we covered. We really enjoyed her. Sofia is a wonderful tour guide. She has a very pleasant way about her. On this walking tour she was very responsive to the needs of our group of 6 age 70 to 75. The lunch at the Vasa Museum was great. We all enjoyed the tour very much. TOUR GUIDE RESPONSE: Thank you! You have great travel companions so keep up the good spirit! We used Sofia for shore trip on NCL Getaway. We met by the Opera House using "on your own" travel from the port. Sofia was very pleasant with high energy. Her knowledge of the city and the sights were excellent. She included all promised highlights, was very flexible adjusting the day based on our interests. She easily added the ABBA museum to please our son. She included "off the beaten path" sights. Open air museum a highlight. One of the best Tourbylocals guides we've had. Highly recommend her! TOUR GUIDE RESPONSE: Thank you Antonia! It was a pleasure to show you my beautiful city and if you love ABBA it is a must to visit their museum. Welcome back! Sofia was terrific. Very knowledgeable and accommodating. She tailored the tour based on our group's diverse interest and made it fun and witty. Sofia was excellent. Very knowledgeable and pleasant. Accommodated our requests. Very pleased. TOUR GUIDE RESPONSE: Thank you Leslie! I hope that you will continue with a great vacation! We spent a very nice and pleasant hour walking through the Stockholm old town "Gamla Stan" listening to Sofia. A balanced mix of history, anthropology, and gossip on Swedish culture. TOUR GUIDE RESPONSE: Grazie Davide! TOUR GUIDE RESPONSE: I am happy that you liked the tour! Yes, we really combined exercise with learning about Sweden and Stockholm:) Welcome back! Sofia was great. Personable, on-time and helpful with my questions. TOUR GUIDE RESPONSE: Thank you Nancy! I hope you had a great time up north! We enjoyed our tour with Sofia. We saw beautiful and interesting sites throughout our walk. And the pace was just right, even for my 80 year old mother in law. Sofia was prompt arriving at our hotel. She gave us a very good introduction to Stockholm and how to move around in it to see that sights. She was fun to be with and very flexible in our desires. TOUR GUIDE RESPONSE: Thank you! You are welcome back any time! Sofia gave an excellent tour of Stockholm. She was very knowledgeable and informative. We are a family of 5, children ranging from 4 to 11, and all of us loved her tour. We thouroughly enjoyed our private guided tour. Sofia was very well informed and I would happily recommend her! TOUR GUIDE RESPONSE: Thank you Mia! Sofia is amazing guide. We were lucky to have her. TOUR GUIDE RESPONSE: Thank you! It was so fun to get to know you! Sofia met us at the cruise port and was ready to go adventuring into town. She is incredibly knowledgable of the history and current times of Stockholm. Her knowledge was extremely broad in many areas. She made the tour fun and witty. Sofia also knows where the great cafes for coffee and sweets are. We highly recommend Sofia for touring Stockholm. The best tour guide in Stockholm! Sofia walked my son and I around for 2 days. We gained a great understanding of Swedish history, architecture, and culture. Sofia understands children, so our tour was a great experience for me and also very interesting and engaging for my 13 year old son. Sofia is a lovely person, who really cares about the clients experience. She is professional and knowledgeable. I cannot recommend Sofia enough! She is the best! TOUR GUIDE RESPONSE: It was a pleasure to show you around! Wonderfully friendly, well organized, and deeply knowledgeable, Sofia took me through Drottningholm Palace outside Stockholm - a must for any art historically minded tourist. She was also able to add to our itinerary on the spot Drottningholm's 17 century theater which I had read about. The best part of the tour for me was the way Sofia quoted from letters kings and queens over the centuries had written about their experiences living in the palace. It made the tour very special! Sofia was an excellent guide. We traveled by boat, subway, and on foot, and were able to see so many interesting parts of the city. The highlight for us was the City Hall where the Nobel Prize dinner is held each year. Such a beautiful and understated building, and Sophia knew so much about its history and use. Everything we did with Sophia was great and enabled us to explore, over the next few days on our own, with the knowledge of how to easily get from one place to another. TOUR GUIDE RESPONSE: Thank you Gina! Very nice walking tour. Excellent English and easy to understand. We had a wonderful day in Stockholm with Sofia. We were able to see the amazing sites of this gorgeous city as well as personalize the tour to do some fun things like visit a local grocery store to buy candy/snacks! I highly recommend a trip to the Vasa museum with Sofia, she is so knowledgeable about the ship and its history. She explained everything and answered all questions we had. We had plenty of time for seeing the gorgeous city, did some shopping and also had some traditional pastries, a MUST! TOUR GUIDE RESPONSE: Thank you! I hope that the rest of your cruise will be great! Sofia was a perfect guide - wonderful sense of humor, extremely knowledgeable, great listener, excellent practical suggestions for learning more about Stockholm. If she is available, I highly recommend that you book her now. I learned so much from Sofia, and her assistance and suggestions added immeasurably to my stay in Stockholm. I had a 24 stopover in Stockholm and was hoping to learn as much as I could in that amount of time about Stockholm. Sofia was perfect! She led me on a half day tour of the city focusing on history and culture. Sofia was knowledgable, interesting, and enthusiastic. She is highly recommended! My wife and I really enjoyed the day spent with Sophia touring Stockholm. She was very friendly, accommodating to our needs and displayed a thorough knowledge of Swedish history. I would give her my highest recommendation. Sofia is a great guide. I definitely recommend her. She is friendly and knows a lot about Stockholm. The pace of the tour was good, we never felt rushed but we saw and learned quite a bit in a short time. This tour is good for those who want some insight into the city's history as well as current day culture and politics. Sofia was a delight to have with us during our time in Stockholm. She is knowledgeable in every topic, more than willing to modify the itinerary along the way, speaks perfect English and can walk for miles. She has a busy schedule so book early! A great experience with a very knowledgable and personable guide. Sofia gave us a short tour of Gamla Stan and we then spent the rest of our time in a coffee shop getting her insights into life in Stockholm plus some really valuable suggestions about other places to visit in our remaining 10 days there. If you need a guide in Stockholm, Sofia is the one. Wonderful tour very informative, Sofia was a real terrific guide she introduced the beautiful city of Stockholm with lots details. Reccomended for anyone who wants a real good introduction to a wonderful European capital like Stockholm. Very well done. Thank You. TOUR GUIDE RESPONSE: Thank you Tim. It was a pleasure meeting you! Sofia was lovely to spend time with. We visited Stockholm in early November when many places were closed, because it was out of season, so we really appreciated her suggestions on how to spend our day. She allowed us to set the pace of our tour which included time for a 'fika'. We were very grateful that she had phoned ahead to a café to check they could provide food for one us who has an allergy. Sofia was both knowledgeable and friendly and we would definitely recommend her. TOUR GUIDE RESPONSE: Thank you very much and welcome back! Everything went according to plan. Our guide was knowledgeable and very pleasant. She had no problem adapting to our wishes and all went smoothly. Sofia was fun, engaging, knowledgeable, and entertaining. She made a somewhat rainy, dismal day one of the highlights of our visit. Our only disappointment was that we only took a 2 hour tour. Wonderful tour of Stockholm! The introduction to Stockholm tour is perfect if you are looking to see the highlights of the city but are short on time. Sofia expertly navigated through all the main sites and even managed to beat the big tour groups so we didn't stand in line or suffer behind big groups to get photos. She was a delightful guide and very educated about the city and its history. It was a great day! Sofia gave my family and me a fantastic 8 hour tour of Sweden recently. She really customized the tour to our interests. Sofia was very knowledgeable and gladly shared her many insights. Her tour what not just about showing us the highlights of her wonderful city, but also about what it is like to live in Sweden. While we were certainly a little tired after 8 hours, she made the time go by quickly because we enjoyed ourselves so much. Her tour was definitely a highlight for us. Highly recommended. Absolutely excellent. Sophia answers all our questions and makes everything interesting and brings the city to life. Very knowledgable. Extremely competent and a great sense of humour. We were a group of 8 persons and she explained everything in detail. TOUR GUIDE RESPONSE: It was a pleasure to show you and your family around! Excellent guide; superior English; expert knowledge of Stockholm and Sweden; very friendly; listened and responded to our tour requests and questions. Lovely walk with Sofia around Galma Stan that helped me go around the next few days. Two hours was just enough. She also suggested activities and restaurants. Thank you Sofia - your city is beautiful and easy to discover! TOUR GUIDE RESPONSE: I am glad you had a good time and thank you for kind words. You are welcome back any time! Sofia is an excellent guide. She led an amazing tour for us today with a wonderful knowledge of Stockholm's history and adjusted her speed for my mother's physical needs all the while. We are very grateful to have been able to see so much so thoroughly in one day. It is well worth the money to have had Sofia share her knowledge with us. We have taken many tours with locals and I think Sofia is more of a professional guide because of her delivery of historic information. Thank you for a great tour! TOUR GUIDE RESPONSE: Thank you! I hope you liked your dinner! Great tour with a great person! We also thank Sofia for stepping in and taking over our tour when the original that we booked was no longer available. Sofia was a fantastic guide. She gave us some great suggestions via email before the tour and the tour itself was fantastic. Sofia is very knowledgeable and super nice, we would highly recommend her! Sofia was a top notch guide and was able to show us the highlights of Stockholm in the time we had together. It was unusually warm while we were in Stockholm and undertaking a 7 hour walking tour might not have been wise, but that was not Sofia's fault. We had a great time and she was fun to be with. Sofia met the six of us at our ship and took us on a four hour walking tour of Stockholm. 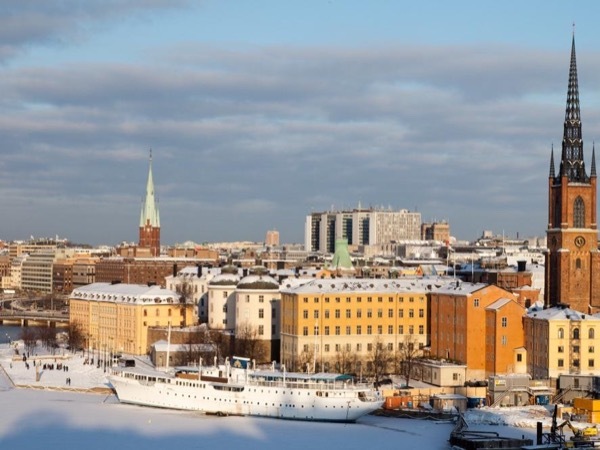 She was very responsive to our requests, and she worked things out perfectly to cover a great deal of ground in the time available without feeling rushed, including the Old Town, the Town Hall, and the Vasa Museum. She is knowledgable, interesting, personable, and fun. We ended with a one-hour bike tour of Djurgarden, which was just beautiful. We enjoyed our time with her very much, and can recommend her highly. TOUR GUIDE RESPONSE: Thank you for coming to Stockholm! Sofia was able to make the tour interesting for a diverse group of people age 10 to seniors. Sofia was an EXCELLENT tour guide. She is extremely knowledgeable about Stockholm/Sweden. She not only knows everything about the museums and tourist attractions but was happy to answer many questions about modern Swedish culture/customs. We did the 8 hour tour with her and visited lots of great places - Vasa Museum, City Hall, Gamla Stan (old town), Skansen open air Museum (highly recommend to experience other parts of Sweden that you may not get to in person). Her English is perfect. Highly recommend! I highly recommend Sofia! She is very knowledgeable about the history of the area as well as what's current in Stockholm. She gives a wonderful tour and is fluent in English. I went away with many ideas for what to do with my remaining time in Stockholm. Sophia was excellent--worth every penny!!! Thanks for a great tour of Stockholm today. Sofia is friendly and knowledgable. The VasaMuseum was outstanding. Next trip we will spend more time there. She made great use of our 6 hours. We covered a lot of ground today! We also enjoyed the Royal Palace and City Hall. Ended the day at the IceBar (after a detour to a great candy shop). We would definitely book another trip with Sofia and recommend her highly. TOUR GUIDE RESPONSE: Thank you! I hope you will have a wonderful cruise! We were a group of 13 family all retired teachers and professionals. We took the all day private tour and were able to cover all the major attractions in the central part of the city including a short ferry ride to Skansen where we spent most of the afternoon. Sofia was very knowledgeable and very helpful and able to accommodate our group well. Overall we were very pleased with the day. TOUR GUIDE RESPONSE: I hope that you had a great "cold" week! Sofia recently conducted an 8 hour tour of Stockholm for 13 of us. I made the arrangements for this tour and I have to say that Sofia is the consummate professional. In planning the day, my emails to Sofia were always answered promptly and she was extremely flexible. Sofia arranged a day with variety - City Hall, Skansen and the Vasa Museum. She is extremely knowledgeable and very easy to be with. I highly recommend Tours by Locals in Stockholm and especially Sofia! TOUR GUIDE RESPONSE: Thank you! I hope that you enjoy the rest of Scandinavia! We just finished two days touring with Sofia and she is not only a great guide for Stockholm, but she is one of the best private guides we have had in any city. She is charming, knowledgable, punctual and has great follow-through. I would recommend her to anyone looking to make the most out of their time in Stockholm. Now, Nobel Committee, if by chance you are reading this, please send her an invitation to your dinner December 10th. She is a great ambassador for your city! Thanks for the great tour Sofia. Sofia is a lovely young woman who also shared personal things. We walked a lot as she had no car but we decided to take cabs as there was too much walking.We went to an Ice Bar at the end - great, great experience. We saw the Vasa and Skansen Open Air Museum - very interesting. The guide at the synagogue we visited, Chava, was very good.She taught us about anti-semitism in Stockholm. Sofia was fun, intelligent, flexible and thoughtful. I had a great tour and would highly recommend her to others. TOUR GUIDE RESPONSE: Dear Patrick, Thank you. I hope you had a great Swedish dinner! Sofia was so attentive and helpful. She was a fabulous tour guide of beautiful Stockholm! Very knowledgeable and an excellent guide. Would highly recommend her. We learned a lot about Sweden and anxious to return in the future. TOUR GUIDE RESPONSE: Welcome back! Sofia was personable and knowledgeable and it was a wonderful experience. We enjoyed our outing very much. The only negative was the taxi service, which had nothing to do with Sofia. She was great!!!! Our 2 days with Sofia were outstanding! She arranged our time to see far more than we could on our own. Her English is perfect and she is charming. Her unique insider knowledge brought history to life. Sofia zipped us around the highlights of each venue but could discuss everything in depth. We enjoyed her perspective on Stockholm life today. A delightful experience. Highly recommend. TOUR GUIDE RESPONSE: Thank you! I hope you will have a wounderful cruise! Sofia is an excellent guide. We discussed in advance our interests and she made our tour a wonderful and personalized experience. Sofia shared her personal experience and helped us learn about Sweden and the culture. Excellent communication skills and knowledge of the area. Sofia helped make our time in Stockholm very memorable. TOUR GUIDE RESPONSE: Peter and Elaine were a pleasure to take around. Thank you! Sofia was a delightful and interesting guide. She made adjustments to our schedule based on what we like to do. Her English is perfect and we enjoyed our time with her. TOUR GUIDE RESPONSE: Thank you I am happy that you liked the adjustments! It was a pleasure meeting you. TOUR GUIDE RESPONSE: Thank you for your company! Sofia was a lot of fun. Sofia knew her way around the town and gave us plenty of advice for our next day in the city. TOUR GUIDE RESPONSE: I am glad you liked the tour, hope your holiday works fine all of over Europe. Sofia was a knowledgeable delight from her on-time arrival to the goodbye at the metro 8 hours later. She was friendly, accommodating and so informative. She gave in-depth explanations of everything, plus she responded knowledgeably to our many questions. We would not have had the same visit to Stockholm, period, or such good tours of City Hall, the history museum, the Vasa museum or Skansen without her. Many, many thanks, Sofia. As to toursbylocals, I will use them again in the future. TOUR GUIDE RESPONSE: Thank you! I hope that I gave you some good suggestions where to go the rest of the week. TOURSBYLOCALS RESPONSE: Thank you for your review Sandra. The reason entrance fees and tickets are not included in the tour price is to provide travellers maximum flexibility to their tours. TOUR GUIDE RESPONSE: Thank you John. I hope you have more time for your next visit! Thanks Sofia! We enjoyed you showing us Stockholm! Very Informative and fun ! Sofia was delightful. We had a wonderful afternoon touring the highlights of the city. Would highly recommend Sofia to anyone needing a experienced tour guide with a great personality. We enjoyed our time in Stockholm. Sofia's walking tour of old town and Riddarholmen was one of the highlights of our trip. The pace was brisk but very comfortable. It is the best way to see Stockholm's sights...and breeze into museums with an informative guide! Thank you Sofia! TOUR GUIDE RESPONSE: Thank you and welcome back! Sofia was a great tour guide. She was waiting for us at the port as promised. She purchased the Stockholm Cards for us ahead of time just like I asked her to. She took us to all the sights we requested and recommended a great restaurant for lunch. I would definitely recommend Sofia. TOUR GUIDE RESPONSE: Thank you Marsha. It was a lot of walking and a lot of fun to get to know you and your family! Sophie was patient waiting for our even though it was an hour late. She was very informative and did an excellent job! Sofia was a wonderful guide and representative of your company. She was extremely informative, very professional and had our tour perfectly planned out. I would recommend her to anyone visiting Stockholm. A super 90 minutes! Sofia gave us a great introduction to Stockholm. She gave us fun facts and great stories and showed us some hidden corners that you won't find in a guide book. I'd highliy recommend a tour as you get your grounding before exploring on your own. Sofia was an excellent guide. Though it rained towards the end of our tour, we were able to see the highlights. Thanks Sofia. Very knowledgeable and interesting. We were a group of 8 people of different ages and interest levels and Sofia did a good job of developing a workable itinerary that met everytone's needs. Wonderful Sofia is and excellent guide very nice and willing to help in every way. She gave us a complete and very good tour of Stockholm. Very satisfied with her tour very good guide and speaks perfect english.